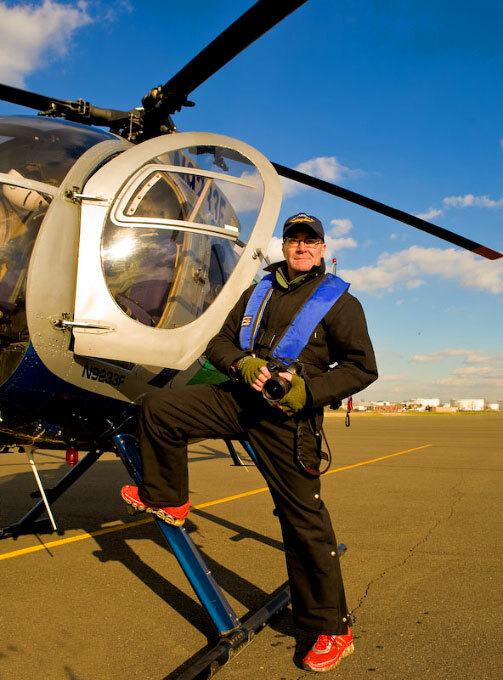 Marine photographer Atkin with MD500 helicopter., Suited up for cold weather maritime aerial flying. Preparing for flight in MD 500, an aircraft with robust redundancy for safety. Aerial photography can be a high risk proposition. Photographing vessels underway with high superstructures from rotorcraft demands plenty of reserve power, multi-blade main rotor systems for smoothness and an authoritative tail rotor to maintain yaw control in turbulence. Turbine helicopters provide the ideal power to weight configuration for these missions as well as smoother flying characteristics as compared to reciprocating (piston) powered machines. Small piston powered helicopters are ideal for flight training. However maritime aerial photography frequently requires "out of trim" flying placing demanding stress on yaw control systems. Some piston helicopter manufacturers state clearly, "avoid "out of trim" flying or risk catastrophic tail rotor failure. Todays budgets are challenging. Our goal is to keep costs in line. But budgets sacrificing safety in underpowered aircraft in maritime environments magnifies already inherent risks and may have dire consequences for the vessel, its passengers, owners, air crew, port personnel and infrastructure. We look forward to completing your aerial photography with complete safety as our first priority. (MD 500 jet turbine with Atkin suited up with flotation gear, underwater breathing tank, & back-up radio).